Cluster analysis of volumes is now available in MetaTrader 5! The YuСlusters indicator is a professional tool for analyzing the trading volumes. The cluster graph is plotted based on tick data. For the exchange financial instruments these are the volume, type and price of a deal. For the Forex instruments - the real or tick volume (depending on the broker) and Bid price. Time interval, the criterion is set in seconds. Price range, the criterion is set in points. The current cluster is closed when the deal price goes beyond the specified price range. In that case, the current deal is included in the current cluster, while the next one opens a new cluster. The range is calculated as the difference between the High and Low price in the cluster. The difference (delta) between buy and sell volumes. The current cluster is closed when the delta with the next deal exceeds the specified volume. The next deal opens the next cluster. Total volume of deals. The current cluster is closed when the total volume of purchases and sales in the cluster exceeds the specified volume after one of the deals. Number of ticks. The cluster is formed by the specified number of ticks. Deal type. A cluster is formed by deals of the same type. "Delta" - display the delta. "Delta %" - display the delta as a percentage of the corresponding ASK or BID volume. "BID + ASK" - display the sum of BID+ASK volumes. "ASK & BID" - display the ASK and BID volumes separately, the ASK volume is drawn in the upper half of the cluster cell, the BID volume is drawn in the lower half. "BID x ASK" - display the ASK and BID volumes separately, the ASK volume is drawn to the right, while the BID volume is drawn to the left of the cluster center. "Delta and BID+ASK" - display the delta and the sum of BID+ASK volumes. "Delta% and BID+ASK" - display the delta as a percentage and the sum of BID+ASK volumes. YuClusters features built-in volume filters, indicators of cumulative delta and weighted average price of the cluster volume. YuClusters has a powerful system of alerts, which can be set to events related to clusters, volumes, prices and built-in indicators. Attention: YuClusters does not work in the Strategy tester of the terminal. You can view the indicator operation in the free version YuClusters DEMO. Вы создали очень сильный инструмент. Тут есть практически все, что нужно в данный момент мне для работы и даже гораздо больше, чем я мог бы себе представить. Фактически это целая платформа для торговли, которую надо еще дополнительно изучать и изучать. Теперь я практически вижу рынок, я стал психологически спокойно работать. И это также очень важно для меня. Огромное спасибо Вам за огромную работу. Graças ao indicador minha performance melhor muito. Спасибо. С первого взгляда сделано очень качественно. НАшел в нем даже больше, чем ожидал. Отличный продукт! Все что нужно для кластерного анализа есть, действительно, достойная альтернатива атасу и вулфиксу!!! Отличный продукт. Лучший для кластерного анализа на МТ5. Спасибо БОЛЬШОЕ, Юрий! This is an excellent indicator. Saved my life many times over. Highly recommended. Would love to see an api for this. Hi, I bought your indicator, i the beginning working fine, now I get a message "out of memory". Do you have a sollution? Отличный продукт, хочется увидеть долгожданное обновление. Так же хотелось бы чтобы автор исправил зависание данных, иногда приходится менять Таймфрейм для перерасчета данных, так как подвисают. Спасибо. awesome tool. the best purchase i did in decades for sure. the best depth of market analysis tool on the market. congratulations for the developer ! Уважаемые коллеги, хочу с уверенностью Вам сказать что индикатор YuClusters выполнен очень качественно и точно! Я в течении двух недель тестировал индикатор и проверял его на достоверность выдаваемой информации, я проверял своего брокера на качество котировок, я сравнивал данные YuClusters с данными всем известной платформы VolFix.Net. В результате тестов выяснилось что YuClusters очень качественный продукт, цена продукта радует, и плюсом является тот факт что продукт постоянно находится в процессе модернизации и улучшения! Скажу Вам по секрету, скоро будет крупное обновление программы, ориентировочно март-апрель 2017. И так для общего развития, минимальная аренда VolFix.Net 100$ в месяц. Индикатор отличный. Но не хватает фильтров и алертов. Т.е. при определенном объеме он закрашивается выбранным цветом и звучит сигнал (по выбору). Великолепное дополнение к терминалу Metatrader 5! Уровень качества исполнения данного индикатора прекрасен. На мой взгляд, индикатор начисто лишен каких-либо недостатков, хотя имеются некоторые особенности, о которых стоит упомянуть. Впрочем, прежде всего его плюсы, а это, во-первых, объём! Я очень хотел реализовать все необходимые инструменты для торговли в одном терминале и, благодаря YuClusters, мне это удалось. Да, конечно, этот индикатор не является полноценным volfix или orderflow, но лично мне оценить объём торгов по некому уровню цены за определенный период времени YuClusters позволяет. Равно как и позволяет следить за этим показателем внутри дня, помогая принимать решения о торговых операциях. За 55 долларов лучше и быть не может! Во-вторых, реализация данного индикатора на высочайшем уровне! С версии 3.0 всё стало ещё проще, понятнее и удобнее + появились дополнительные настройки, которых так не хватало раньше (Price Scale, например). В-третьих, поддержка от Юрия помогла решить многие вопросы. В доказательство тому вкладка "Обсуждение". Спасибо, Юрий. Недостатков я не вижу, но есть особенности. Прежде всего "множитель" параметра "Масштаб цены". Я не знаю, почему сделано именно так, я ожидал возможности руками вводить нужные цифры, а не выбирать из предложенных. Предложенных мне, пока что, достаточно, но хотелось бы "ручного режима". Иногда приходится обновлять показания индикатора "кнопкой" или просто сдвигать его в сторону, потому что данные в кластерах не обновляются. Не знаю, почему это происходит (при том не всегда), моей торговле не мешает. Подводя итог, я хочу сказать, что могу поставить YuClusters 5 звёзд с маленьким минусом, с учетом "особенностей". Если вы сомневаетесь в покупке, хотя она полностью оправдана его возможностями и текущей ценой, то возьмите индикатор в аренду и испытайте со своей стратегией или системой, поддержите автора, потому что продукт заслуживает вашего внимания! Если Юрий решит обрадовать нас новыми обновлениям, то очень бы хотелось дополнить индикатор возможностью изменять расцветку интерфейса на тёмную + решить озвученные "особенности" или пояснить, чем они могут быть вызваны. - Added "magnifier", on/off - press space key. - Fixed display profile in form of delta. - Fixed user profile offset. - Fixed error setting value of VA period more 255. Fixed bug in the interface. - added built-in interface help. YuClusters compiled under the new version of the terminal(build 1940). - Fixed an error that sometimes prevented downloading the history. - Fixed an error that caused the indicator to crash on certain instruments with missing history. The Divisor parameter is enabled in filter settings. - shifting lines from a cluster chart to other open charts. Modified the VWAP indicator, added the calculation period. Added the cluster volume indicator and the moving average indicator. Added "hot keys": switching the cluster view and moving the chart. Added a second profile on the right side of the chart. Profiles can be calculated for a specific number of recent clusters. Added customization of the price scale. The price scale can be changed using the mouse in the price area of the cluster chart. Added the ability to move the indicator lines on the main chart. Added the ability to display horizontal lines from the main chart on the cluster chart. Added a divisor of the indicator values. Added centering of the current price on the chart. Added shifting of the main chart to the bar corresponding to the selected cluster. Added new events to alerts. Added scrolling of the cluster chart using the mouse wheel (works with build 1653). Added tooltips for the indicator parameters. Fixed an error that could occasionally appear when loading the tick history. Fixed an error that could occasionally lead to constant re-loading of the tick history. - New cluster type, where volumes are grouped by the deal type. - 3 new types of cluster representation. - The second indicator of the cumulative delta with the ability to set time or period as a parameter. - A window for quick navigation between clusters. - Ability to customize the color scheme of the indicator. - Ability to set the start time for clusters and profile. - Interactive tooltip for the indicator settings. - Ability to add interface languages. Fixed error that could sometimes stop the indicator and disabled trade level dragging option using a mouse. - Added a tooltip. Volume, number of buy/sell ticks (trades) and delta are displayed for a profile, total volume and cluster levels, while a date is displayed for a cluster time. - Expanded tick history: applied data types are now displayed in the info window. - Fixed setting a random color for horizontal levels. - Fixed cumulative delta calculation. - Fixed occasional un-synchronization of cluster and profile display. - Connected the tick history of the terminal. - Added the tick volumes filter. It is possible to set a range of tick volumes, that will participate in the construction of clusters. A zero value of the parameter disables filtering on this parameter. - Added the ability to save settings to a file. - Added delta to the volume profile. - Added sum and volume delta of each cluster. - Added the current price line. - Increased maximum font size in the table. Fixed display of the the current cluster. - Fixed bug in Depth of Market display for Forex symbols. - Changed the function of the button for shifting the table to the current cluster. Now, it enables/disables automatic shift of the table to the current cluster. - Changed the function of the button for aligning the table by price. Now, it enables/disables auto aligning the table by price. - Fixed an error when forming a cluster profile. - Added display of the market depth. - Added dark color scheme. Fixed the table display error occurred during a vertical shift of clusters on some symbols. - Fully modified interface: the indicator is controlled directly from the chart. - Adjustable "depth" of clusters. - Price scale can be changed. - Adjustable appearance of clusters and a profile. 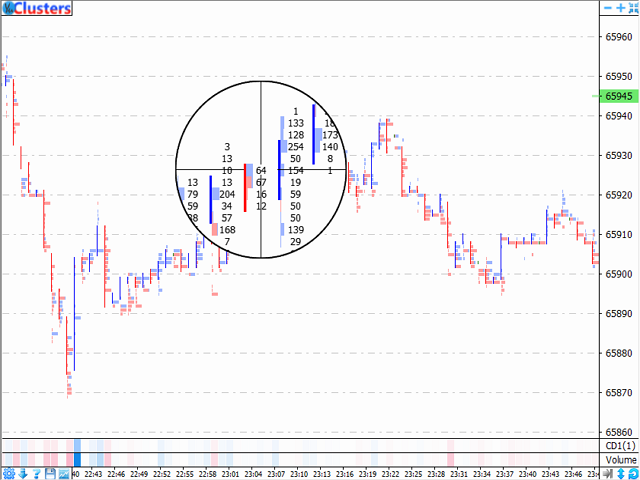 - Selected cluster "highlights" time of the cluster opening on the main chart using a vertical dashed line. - Corresponding cluster is selected by double click on a "candle" of the main chart. - Ticks and clusters are exported to a CSV file. - Tick history is stored during 90 days. - We have changed screenshots and added video in the description. - Added an option for history tick simulation, history depth can be selected in the parameters. - Up to four price levels can be selected in the table. Use a single or a double click for selection. A new parameter for selecting price accuracy (number of decimal places in the price) has been added. 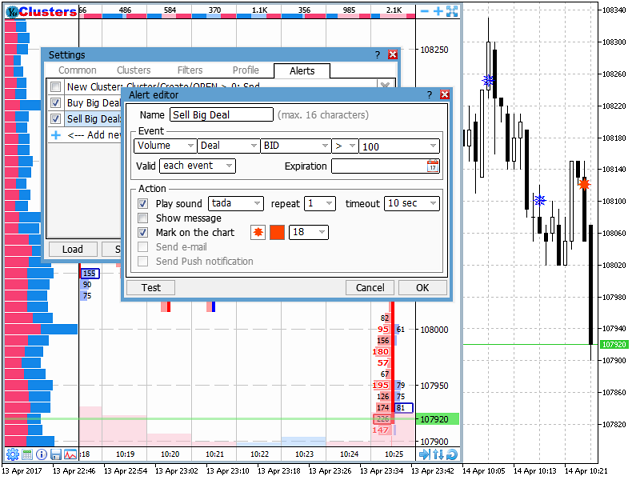 - Now the indicator works with Forex instruments. In cases real volumes are not available, it will use tick volumes for calculation. - For Forex instruments you can select actual current price. - Fixed the synchronization of tick history. - Added chart navigation: shift along the price and clusters. - Added chart zoom: zoom in/out the chart. - Added screenshot explaining new features.